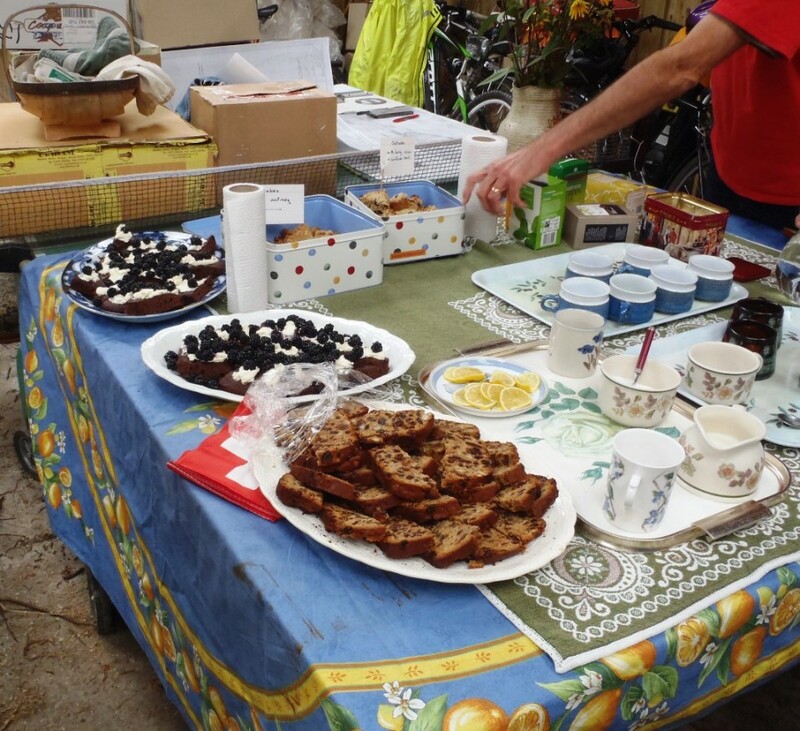 Thanks to a decent turn out and the weather, it was once more a success. The rides programme relates to the ride numbers below. This report provides facts, figures and feedback, and makes recommendations for the next Festival. Day 1: Sat. 15 Sept. The sun tried to shine, but at least it didn't rain. 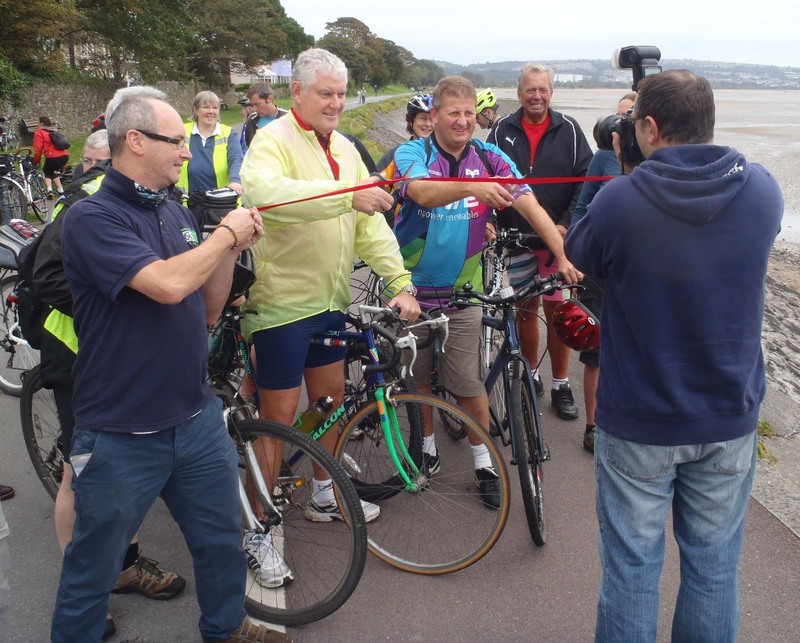 The launch took place by Ripples Café where Byron Davies AM (Shadow Minister of Transport) cut the tape. The first three rides then took off with the Minister joining the Family Fun Run round the Bay. 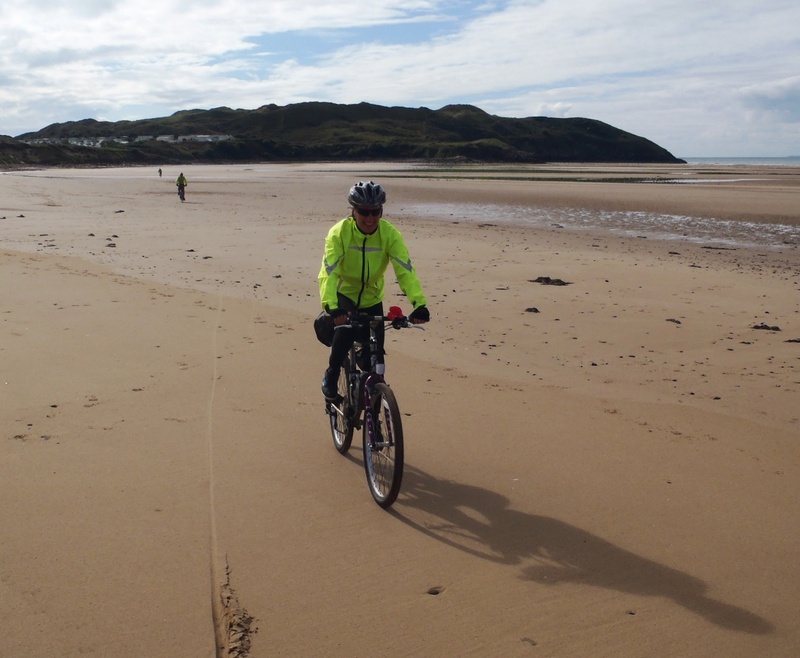 19 took part in the Gower Taster (Ride 2). This ride returned via the ford at Parkmill. 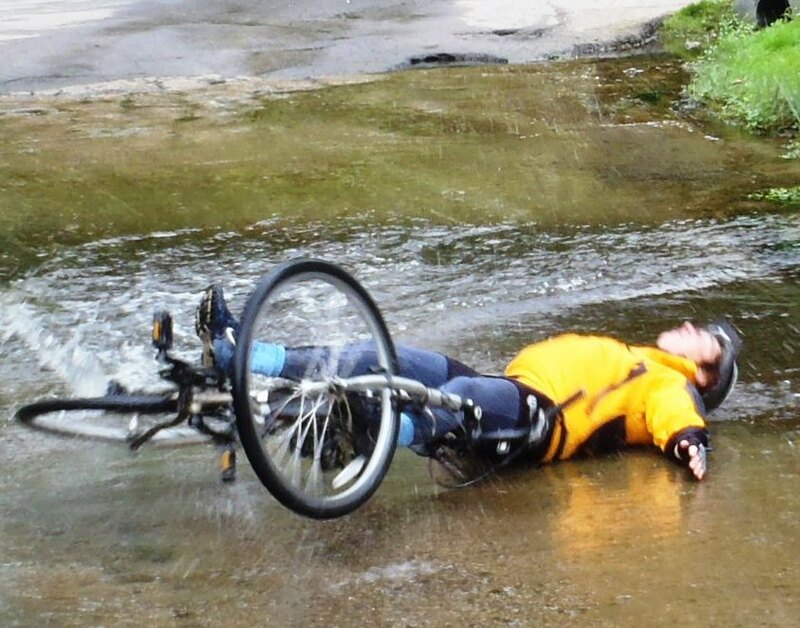 You didn't have to cycle through it and the leader did warn that it was slippery. Some people need to learn the hard way! Day 2: Sun. 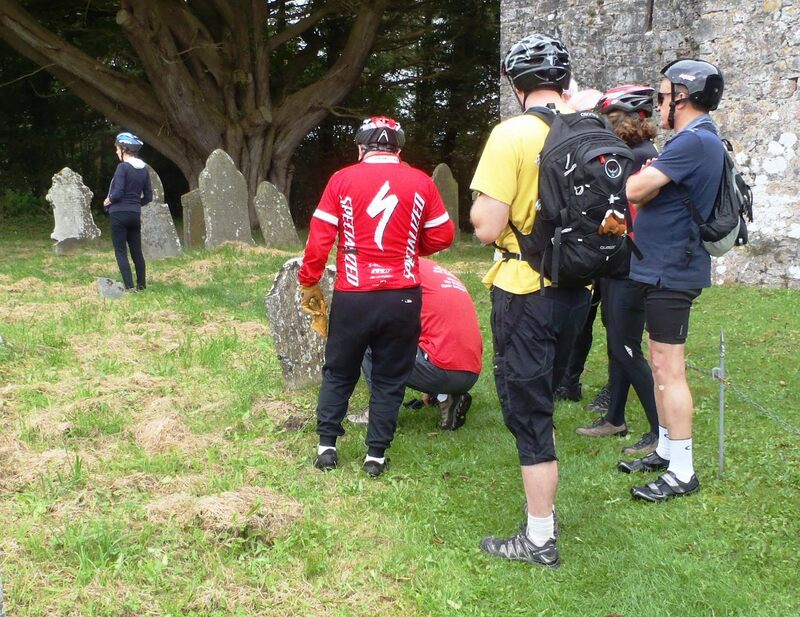 16 Sept.
Overcast on the Gower, but (unusual for these Festivals) the nine on the challenging Carreg Cennen Castle ride (No. 6) got rained on. There were ten on the Cefn Bryn MTB ride (No. 5) including the three children Tom, Emma and Lucy. Judging by their smiles afterwards they coped magnificently with a ride which would challenge many a grown up. 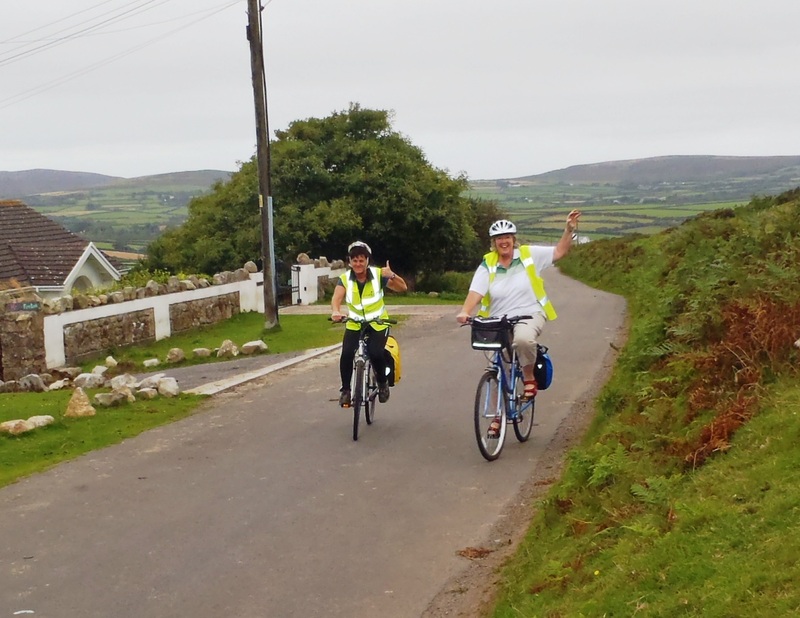 There was only the leader with two brave ladies on the Cefn Bryn road ride (No. 4). The picture shows them near Reynoldston on their way up Cefn Bryn. Judging by their smiles it seems they also enjoyed themselves. Day 3: Mon. 17 Sept.
Day 4: Tue. 18 Sept.
A lovely day if a little chilly. The two rides went as planned. There were 8 on the City Heights ride (No. 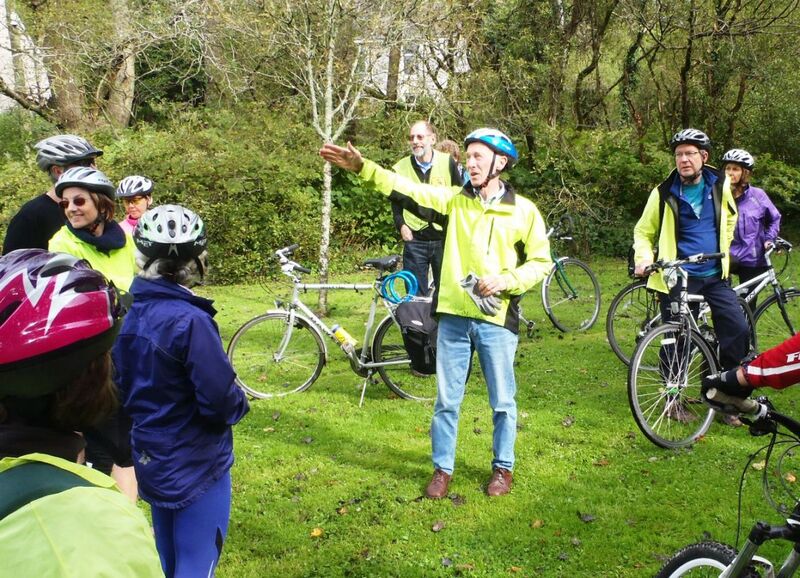 10) and around 14 on the BikeAbility Wales event. 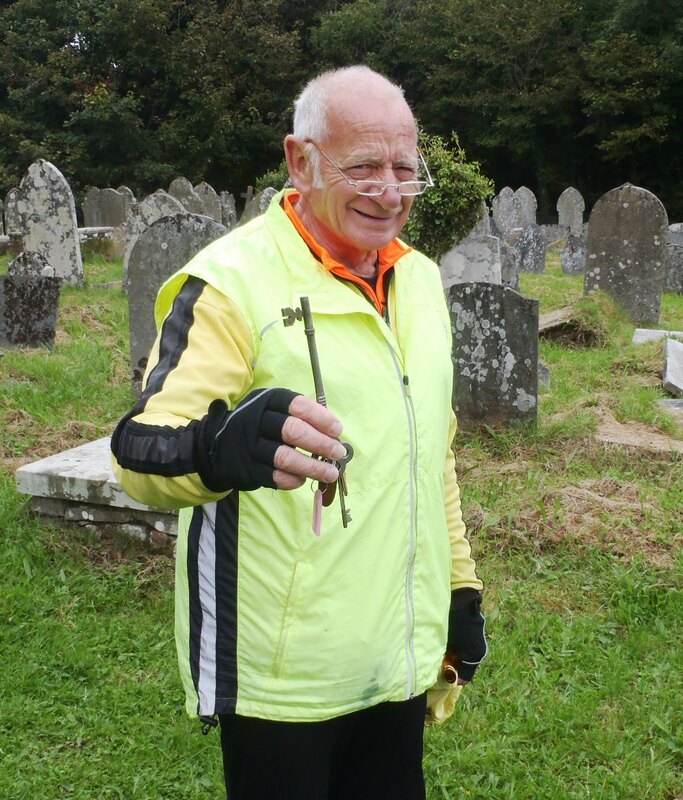 (No.11) Most on the latter were to some extent disabled, for whom it was a novelty to venture beyond the Dunvant RFC grounds. They managed the downhill ride to Blackpill no bother, but help from the more able bodied was required to get them back up again! Day 5: Wed. 19 Sept. Relatively cold but sunny. 16 headed off on the Swiss Valley ride (No. 13) for the hills to the north of Swansea enjoying lunch in the Welsh speaking Caffi Cynnes in ontyberem. There were 8 on the North Gower Circuit (Ride 12). 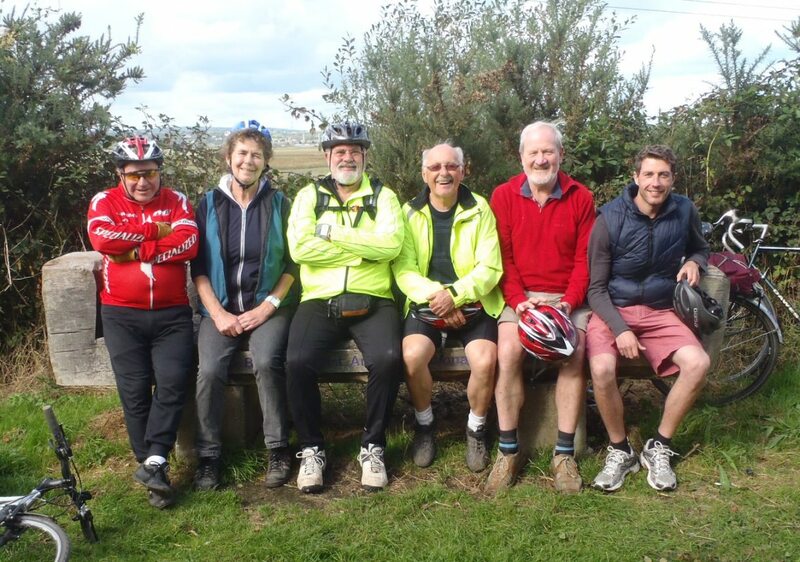 The photo shows them on Bob Burn's bench on the coast path. Bob, who sadly died in 2007, co-founded Wheelrights together with David Judd and Veronica Wood in 1995. Veronica is second from left in the pic. A small group explored Mumbles and a pub or two that evening on Ride 14. Day 6: Thu. 20 Sept. The odd shower but mainly fine. Again there were two day rides and an a evening one. While 7 "roadies" headed off for over 70 miles into the wilds of S. Wales 21 set off on the easy Sustrans Fresh Air miles ride (No. 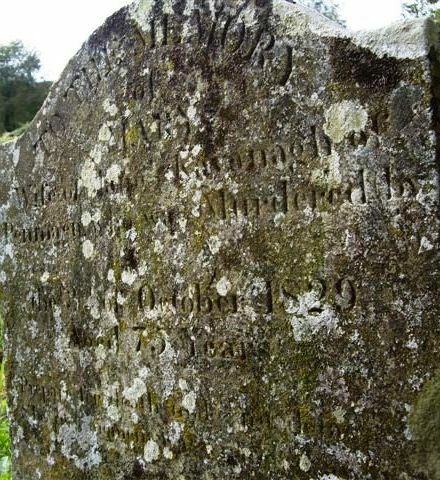 15) to Penclacwydd. The pic. on the right shows John Roach describing the industrial past of Dunvant. 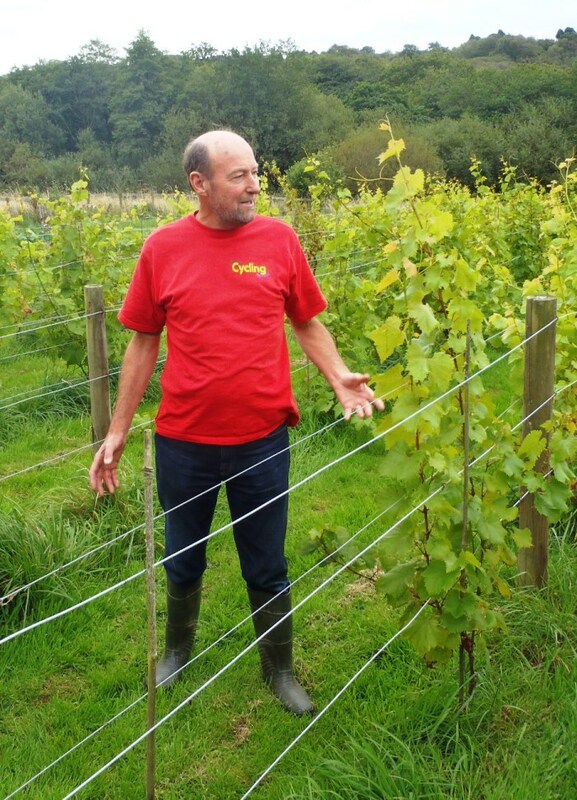 The highlight was Ddol Farm where Colin Fielder showed us his vineyard and treated us to tea and cake. Day 7: Fri. 21 Sept.
Another fine day. Maybe people were tired as there were only 4 on Ride 18: a gentle tour of Mumbles and Clyne Gardens, and 5 on the Grand Gower Circuit (Ride 19). The latter was a great success faithfully following the coast with even a crossing of the Broughton Bay beach before afternoon tea in Llanmadoc. 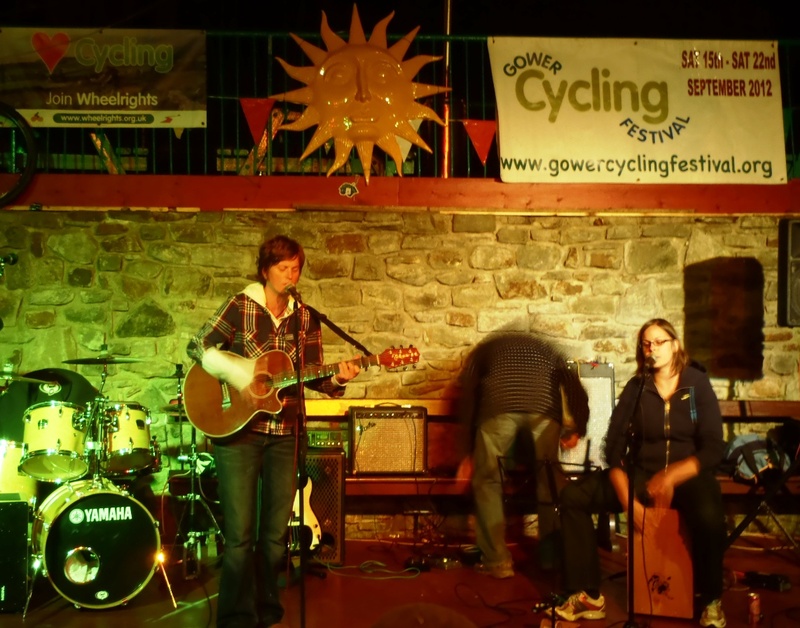 The Festival Party took place that evening in the Gower Heritage Centre. The picture shows Scotty on her guitar accompanied by Rhiannon. 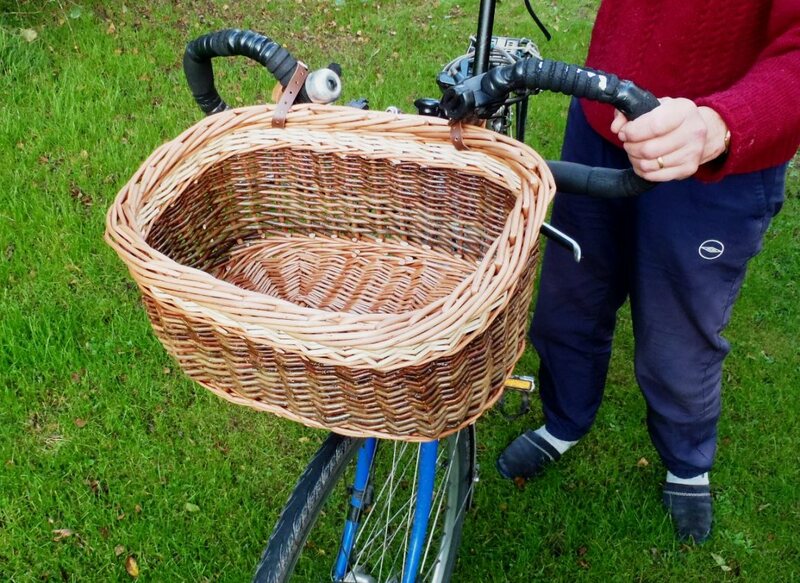 There was a raffle with as a special prize a bicycle basket made by the wife of one of the organisers. Day 8: Sat. 22 Sept.
A cloudless end to the Festival. The three final rides were well attended with 11 on the Ride/walk (No. 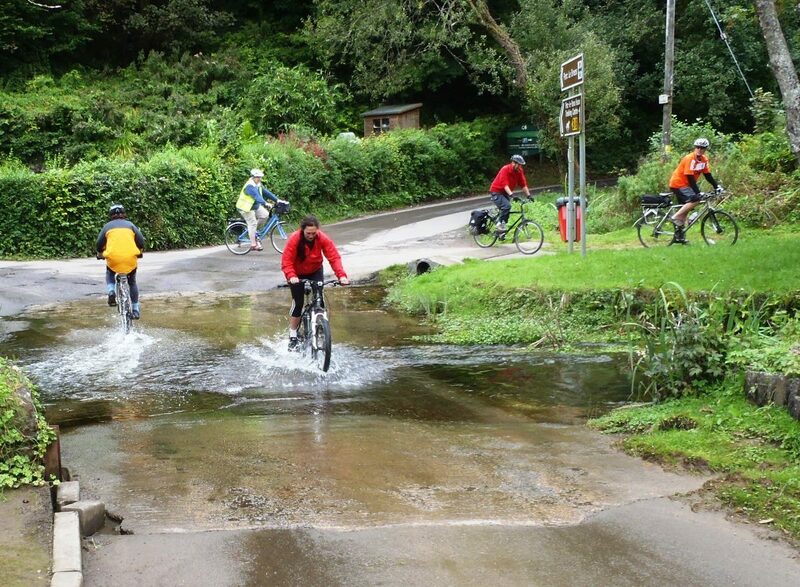 20) to Three Cliffs, 24 on the Tandem ride (No. 21) and 13 on the challenging Heritage Trail mountain bike ride (No. 22). The photo, taken on the walking part of Ride 20, shows Three Cliffs Bay from Pennard Castle. (The three cliffs are out of sight to the left of the beach.